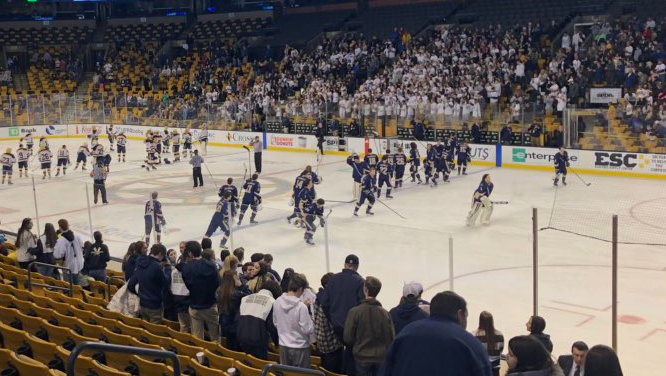 BOSTON - The Shrewsbury Colonials upset Hanover, handing the Indians their only loss this season and capturing a second consecutive Division 3 state title in the process. Shrewsbury relied on their top line of twins Anthony and Liam Quinlivan, and Tyler Borys, along with goaltender Pat Shaugnessy to earn a gritty 2-1 victory at the TD Garden. The game started with a balance of pace and not much action. Both goaltenders were relied on heavily to start with a few posts included. One of those came with 6 seconds remaining in the first, with Anthony Quinlivan ringing iron after a great backhand to forehand move. Tyler Borys opened up the scoring for the Colonials in the second period after a beautiful two pass sequence from the Quinlivan brothers, the best coming from Anthony when he slipped a pass back door to find Borys and put Shrewsbury up 1-0. Shrewsbury ran with the momentum until late in the period, when a few costly penalties propelled Hanover to some quality scoring chances. Still, Shrewsbury senior goaltender Pat Shaughnessy shut the door. The third period was full of action, as Hanover’s Zach Taylor buried a pass from Lucas Lanagan right under Shaughnessy’s pad to tie it up. From there on it was all Shrewsbury from the net out. James Tepper ended up getting the game winner on a great individual move in the Indian zone and finishing top shelf on the back hand. Shrewsbury finishes the year 16-2-2 and yet another victory at the TD Garden.